Instructions: Card size 6"x6"(final size) cut from off-white cardstock. Cut designer paper 1/8" smaller than the final size and adhere to the base using dries clear adhesive. Now diecut one eyelet circle and paste it at the centre of the card with foam tape to add little dimension. Diecut two of the festive holiday die and paste them on the left and right side. Stamp Large and small Camelia Carnation with archival ink-plum and then cut them with coordinating die and color them with berrylicious colorbox ink on the edges. 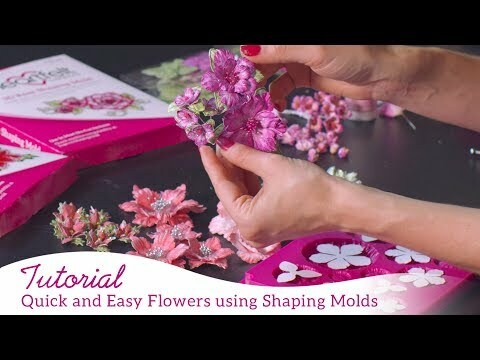 Sprinkle a little water at the back side then place them on the 3D Floral Basic Shaping Mold to achieve delicate detailing on each petal piece, and send the entire mold through die cutting machine to shape. For extra added dimension and detailing, finish off with a touch of hand shaping using the deluxe flower shaping kit. Assemble all the petals and then sprinkle with diamond dust and on leaves sprinkle crystal clear. Add the sentiment "Celebrate" from the designer paper collection, with foam tape to add some dimension. Cut two sweetheart border die and paste it on the edge of left and right side as shown.